That's the weather mapping that is over Orlando today. And no, I'm not in the little white section. Add in the fact that my car is at the shop and you've got a very dreary stuck-inside kind of day. 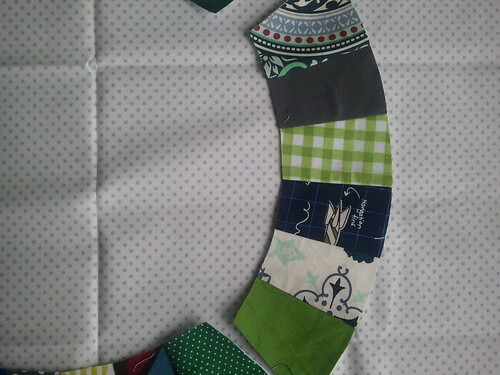 A sewing kind of day! 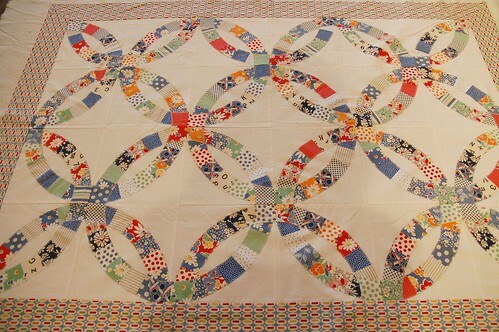 So Jennifer and I have been working on DWR quilts, and cheering each other on. She's making hers out of Fandango, and I'm taking the opportunity to reduce my scrap bucket. Sadly, that meant that my cutting experience was probably a million times longer than hers, since I had to cut each piece individually. 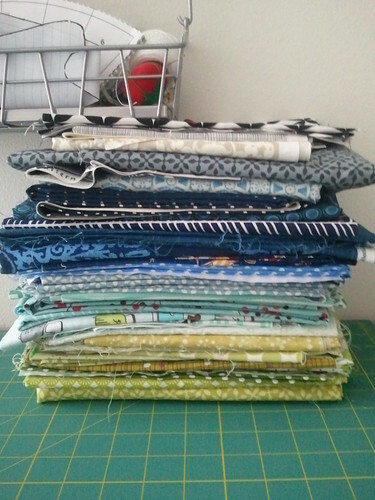 I got 120 squares out of my tiny scraps without any apparent difference in the volume of the bucket! 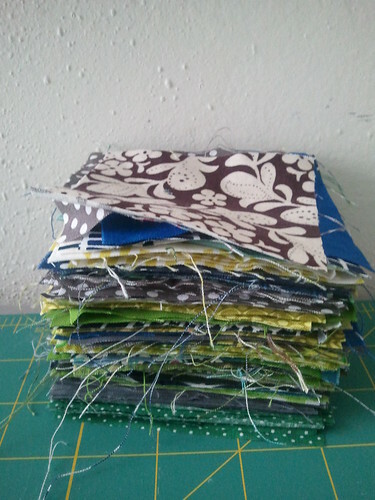 I did have to supplement my stacks o' scraps with some yardage too. So here's where you come in! 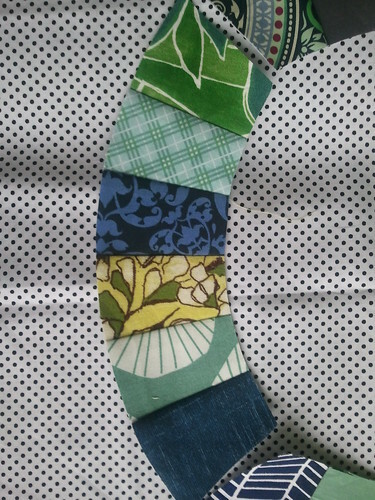 I'm having trouble deciding on my background fabric. 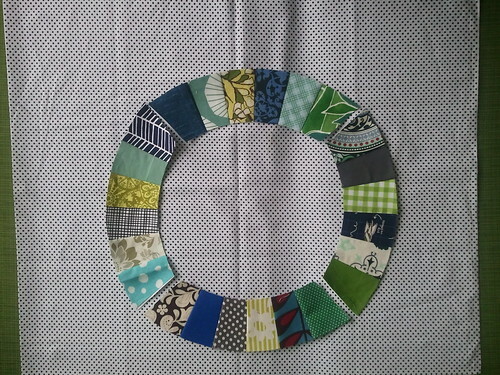 The picture above is a DWR from a class at the workroom so you have an idea of what the final piece will look like. ...or this light blue and white pin dot? Pictures are a little dull in color due to the aforementioned weather conditions, but hopefully you've got an idea of what it will look like. 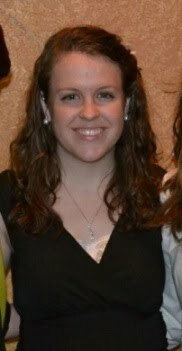 Help a girl out, and let me know what you think! Light blue and white!!! 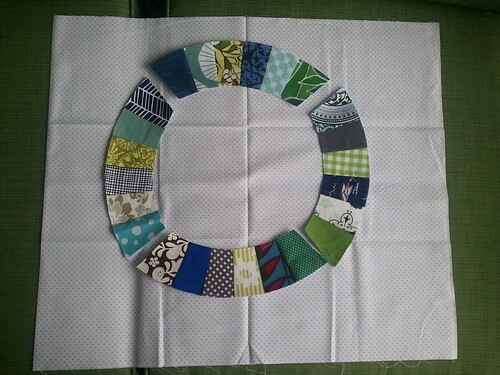 Makes the colors of your rings pop more - at least in these pictures. Light blue dots is my vote. No chance you want to use both? Those rings look so lovely I vote for the light blue dots as you wouldn't want anything to distract from them! I love you choices, they'll both be good whichever you settle on. The darker polka dots are really cool and I really like those! The light blue dots are nice though as they let your wedding rings take focus. If I had to pick one, I think the darker dots are more exciting and work really well!! it's 93 today...Tell your gloomy weather to come to my house! Both are great but I love the black version. It's just punchier! I like the suggestion of navy blue, but if that means you have to purchase more fabric, then I choose black. I like the black best but both look great! Both are nice but I think the black pin dot is more va-va-voom. Am I too late? I love the black and white polka dot one!